Customer Acumen, this quarter, looks at Building Markets through Superior Customer Relationships. Companies today are constantly trying to focus on maximizing customer satisfaction while ensuring that they continue to create a market for their products and services. They walk that extra mile to engage in their customers' journeys and experience. A successful and engaging journey will build and ensure a lifelong relation with their customers along with the economic benefits of increasing revenues and sales. 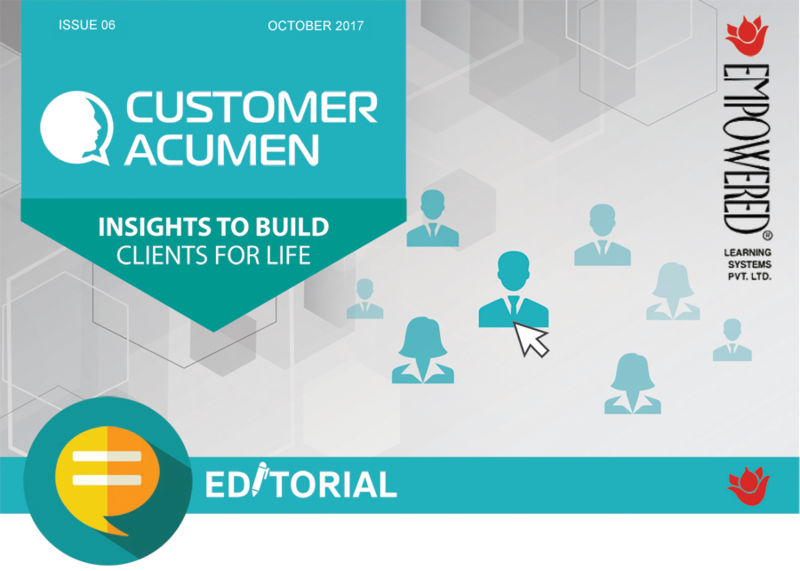 Customer Acumen, this quarter, looks at Building Markets through Superior Customer Relationships. Jay engages us on the main reasons as to why customer relations fail and offers some thoughts on how to maintain them. Srinivas Krishnan, Crown Worldwide Group's Regional Managing Director shares his thoughts on the importance of building superior customer relationships especially in the services sector. 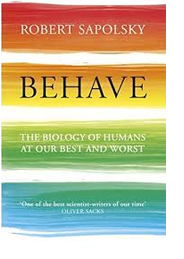 Prasad Deshpande, reviews Robert Sapolsky's thought provoking book, Behave: The Biology of Humans at Our Best and Worst, which examines why humans behave the way they do, and finding the answers in our biology, the nervous system, hormones, evolution and the environment. 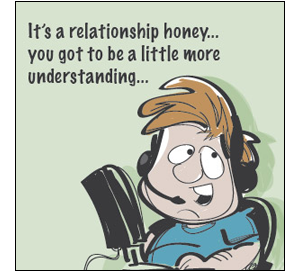 Vikram Nandwani's toon takes the concept of Customer Relationships to a different level! As always, we value your feedback and your comments on what else you would like us to feature for your benefit in the upcoming issues of Customer Acumen! All firms emphasize that customers are important and today train their business development personnel to nurture relationships with care. The principle of creating a win-win deal is also known to both sides obviously. Given this insight into each other's needs, why do relationships break down causing both to start again? Absence of trust: Generating trust is an investment that needs patience and deep commitment. Patience is a rare commodity in today's times when everything is moving at a rapid pace. Both sides are in a hurry to move on to the next big thing, and the social sophistication that one associated with relationships has vanished from the business world. Moving to the second aspect of deep commitment, this too is under pressure in current times when everything is transient. The situation in many large organizations today is farcical at times, with tasks having been compartmentalized into smaller chunks between those who have the need, those who initiate the process and an anonymous procurement official who attempts to negotiate without a clue to the actual need or the true worth of the delivery partner. Matters get more complicated when organizational churn & attrition causes changes in the personnel involved in the discussion or negotiation. The consequence: there is no investment in building trust as everything is transactional in nature. Distorted communication: It is a truism that communication works best when there is active listening on both sides. Often the only way of discovering the true needs of the customer is through carefully listening to the unsaid. This could be a note of concern at your claims (customers are very skeptical of hyperbole) or there could be a credibility challenge that your firm (and hence, you) face. Likewise, if you are reading the signals right in the meeting, then you are listening in an engaged fashion and can therefore address the unsaid concerns which could be visible either through the body language of the prospect or even in the choice of words. Either way, if the barriers in communication are not tackled, then the bridge of meaning that connects both sides cannot be safely constructed and the parties cannot traverse over it and find common ground. The wrong players are in the picture: Never rule out the possibility that you could be talking to the wrong person from the client's organization. However wonderful your product or service is, if the person whom you are meeting is someone without the need, authority or economic clout, then the message will not be delivered. Such misdirected missives are a sheer waste of your time as you would be speaking to the unversed who may find you interesting but cannot take further steps with you in the sales process. The primary reason why this happens is your lack of preparedness - you have not done sufficient research on your prospect and are therefore meeting the first person who agreed to see you and not the one who truly matters. Sadly, the value proposition that you pitch to such a target is meaningless and an overkill. The best way of salvaging the situation in such cases is not to burn bridges with the person whom you meet, and instead convert him into a guide who can direct you to the right prospect in the firm and hopefully open the door to this new prospect for further discussions. While all the above sounds like a recipe for a lost sale, it need not be so. Professionals who know the art of the deal understand that not all business covenants are quickly done. Often there is a slow dance while the parties size each other up and each industry has its own cycle of sale. In the B-to-B segment in particular, this could extend to months (and in very high value global contracts, perhaps into years). Not having the stamina or the temperament for this exercise means you are not ready for this game, and you must equip yourself better. But for those who do have it in them to take the long view, the issues listed above are not constraints. If anything, they offer valuable clues to amend their approach and begin again with the right step. Srinivas joined Crown Worldwide Group's Indonesia operation as Financial Controller in August 1997. He turned around the business in less than a year, consulted on several cost and control initiatives helping Indonesia win the award for top performer in the group in the year 2001. He also initiated the conversion of the office into a foreign company for more professional management, alignment of group culture and seamless implementation of Group initiatives. In June 2010, Srinivas was promoted as Managing Director of Crown Worldwide Group's India operations and in the year 2012 got designated as the Managing Director, South Asia, where he has overall responsibility for India, Sri Lanka and Bangladesh. 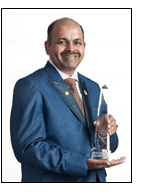 In recognition of his inspirational leadership and the stupendous performance of Crown South Asia, whose fortune he revived and set on a northward trend, Srinivas was awarded the Chairman's Award for Outstanding Individual Excellence in April 2016 - a rare feat, making him only the 8th recipient ever of the award in Crown history. He is also an accomplished speaker and has been a part of several business conferences, seminars and panel discussions through the years. He was recently invited to speak at the 'Emerging Markets Summit' by the University Of Chicago Booth School of Business, where his talk on investing in India was lauded and widely appreciated. Srinivas has several degrees including Master of Commerce, Chartered Financial Analyst, Chartered Management Accountant from India, Chartered Management Accountant from UK, Chartered Global Management Accountant from US and Master of Business Administration from Chicago Booth. Further, he qualified from the International Coach Federation and Toastmasters International and graduated from the prestigious Crown Leadership Journey program in the year 2012. Besides being an active marathoner, Srinivas played for Indonesia in the International Cricket Council matches in the year 2005 and 2007. Srinivas has been actively associated with Smile Foundation's initiative for children's education over the last couple of years and has participated in interactive outreach programs designed by the Foundation. CA: You are primarily in the B2B segment in India with your records management and world mobility services. How does one manage these two segments in an environment where firms compete hard for the customer's share of wallet? SK: We believe in the concept of Economic value, where we define value as per the needs of the customer in each Strategic Business Unit, to create value, deliver value and capture a portion of the value delivered. Value is defined in terms of attributes which for customers creates peace of mind, reduces pain points and eliminates uncertainty. This lets customers focus on their core competence and allows us to serve them seamlessly. CA: Building superior customer relationships is of paramount importance especially in the services sector. How do service firms acquire and retain customers for the long run? SK: Customers are always acquired with a long term horizon in view. Keeping the quality unparalleled at every instance of service and lifting it every time we get to serve, keeps the customers happy, giving them little reasons to look elsewhere. CA: In a world where customer service principles are known to everyone, how can a firm distinguish itself and win in the market place? SK: We can define different levels with service customers. It goes from criminal to basic to expected to desired to surprising to unbelievable. At first, a customer is always sceptical while using any service provider and respects the brand and confirms the service. This is the starting point. With every future service points, we should aim at going one notch higher to exceed their expectations and thus grow our brand value while building the satisfaction level. Once a firm gets used to serving customers seamlessly, every former customer can be a referral point for future customers. Serving our existing and new customers with the latest tools in the market while keeping the basics of service attributes intact in terms of unparalleled acumen is the sole secret to differentiate a service firm from others. CA: What is your advice to young business development professionals new to the services sector? SK: Business Development Professionals (BDPs) should know the product in and out and be clear about what the customers need instead of speaking everything they know about the product or service. Better awareness, leads to better choices offered and hence better results for customers. CA: Please share with us more about Crown's presence in India and your plans for growth in South Asia. SK: We are in Relocations, Records Management, World Mobility and Fine Art services in India. Crown Worldwide Group is present in 12 locations in India, one location in Sri Lanka and is foraying into Dhaka soon. We are expanding to add few more locations like Lucknow, Vizag, and Guwahati depending on where our customers prefer us to serve. Crown is a global network with over half a century's worth of experience. We are at our best when we are working together, leveraging our employees' expertise, creativity and diversity. It's this teamwork, this blend of ideas and cultures that allows Crown to provide the best service to all our customers, regardless of where they are in the world. This is an important book, especially for those of us who have no idea what is an insula or whether the PFC stands for anything else except for the Pre-frontal cortex and for whom the hippocampus could be related to a hippopotamus. These terms describe parts of our brain. Understanding how our brain works is central to understanding how we behave. In this magisterial book, Robert Sapolsky explains how our brain works and more, as he explores a very relevant question. How come we are capable of so much horror - remember Rwanda, Las Vegas, and yet capable at the same time of doing so much good. Robert M. Sapolsky describes himself as 'passive aggressive, mild, geeky with a casual hippy hairstyle'. He was a recipient of the MacArthur genius grant at age 28. He then settled into a career as neurobiologist and primatologist at Stanford University. He conducted field work among baboons in Kenya for 32 straight summers without a break. Why baboons? 'They live in relative safety in groups of 150 in the Serengeti, work/forage for around 4 hours a day and spend the rest of their time making life miserable for their fellow baboons, like us humans'. Along the way, Robert has written books with such tongue in cheek titles - "Why Zebras Don't Get Ulcers" and "The Trouble with Testosterone." Don't let these titles fool you. Behave is a not an easy read; it is a survey of the science of human behaviour and a lot of hard science interspersed with great anecdotes and stories. But what enthrals is the synthesis and the 'connecting of dots' as he weaves insights from different disciplines to drive home the central theme of the book. The context and meaning of behaviour are more interesting and complex than the mechanics of behaviour. "To understand things, you must incorporate neurons and hormones and early development and genes and recognise these are not separate categories." They are all connected. Sapolsky does this by using time travel as an organizing principle! For example, if you reach out to someone, swat a mosquito or do something, seconds before your action, it is neuroscience that investigates what is going on in the brain- the intricate web of neurons as they fire up. In the hours leading up to the behaviour, hormones play a critical role. Moving further back to your adolescence and childhood, Sapolsky explores the environmental factors such as poverty, safe neighbourhoods which could have influenced you. Moving back to conception, he explains, in one of the longest and more technical chapters in the book, the role of DNA as well as epigenetic components. Moving beyond the birth of the individual stretching back thousands of generations to the level where Darwinian processes explain why the systems that produce behaviour evolved in their particular, haphazard way. He also explores the impact of culture, evolutionary psychology, game theory and comparative zoology. Sapolsky is very good at presenting a standard view and then lining up objections from other research particularly in brain science. The idea is to prove that we have limits to our knowledge. In fact, he dismisses many pet assumptions about evolution. A classic example is the belief that evolution selects traits that prove useful in the future. This doesn't happen. Evolution selects traits pertinent to the present. Testosterone for example, does not cause aggression but amplifies pre-existing tendencies for or against it. The actions of such molecules in general "depend on context". Many of his anecdotes are great. For instance, during the filming of Planet of the Apes, people playing chimps and gorillas ate in separate groups during lunch time; the World War 1 Christmas truce where soldiers of both sides spent the day singing, praying, partying together, playing soccer and exchanging gifts - all of us together for one day vs officers in the rear who would go back to killing each other. Sapolsky examines Walter Mischel's famous experiment from the 1960s and '70s, in which children of all ages were shown a marshmallow and asked to defer eating it for 15 minutes, with a second marshmallow as a reward for their self-restraint. Mischel's next step made his studies iconic - he tracked the kids forward, seeing if marshmallow wait time predicted anything about their adulthoods... five-year-old champs at marshmallow patience averaged higher SAT scores in high school (compared with those who couldn't wait). Forty years post-marshmallow, they excelled at frontal function, had more Prefrontal cortex (PFC) activation during a frontal task, and had lower Body-Mass Indices (BMIs). A few key themes are constant throughout this book. Genes aren't inevitabilities. They are about potentials and vulnerabilities and don't determine anything on their own. Evolution is most consequential when altering the regulation of genes and not the genes themselves. You can't understand aggression without understanding fear and what the amygdala has to do with both. Brains and culture co-evolve. Our worst behaviours are the ones we condemn and punish are products of our biology and this applies to our best behaviours as well. So where is then the concept of free will? Sapolsky explains at great length why he believes there is no such thing as free will and yet at the same time admits that he would find it very hard to live without the illusion that he had free will. Sapolsky is above all an optimist. His book offers a better understanding of just where our behaviour comes from. Darwin would have smiled.